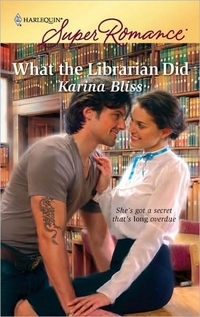 "A bad boy is 'Rockin' the librarians world..."
I've recently rediscovered my love of category romances. They suit my mood perfectly...they're short, they have fully fleshed out characters, and they allow me to travel without leaving the comfort of my favorite reading spot. This month I've discovered Karina Bliss. Her newest title WHAT THE LIBRARIAN DID allowed me to travel to another continent while sipping my coke, and relaxing in my own home. With approximately 250 pages to tell a story it takes a good writer to put all one conflict in a story, it takes a truly talented writer to be able to expand that one conflict into two, and resolve both to the satisfaction of the reader. That is what Ms. Bliss was able to do with WHAT THE LIBRARIAN DID. Rachel Robinson is a librarian at a large university, and while she might have had one rebellious moment as a teenager since then she's attempted to lead a quiet somewhat sheltered life, so when superstar Devin Freedman enrolls at the university she truly has no idea who he is, or what his impact had on the music world, and is certainly not prepared for the impact he will have on what she considers to be her nearly perfect world. Not only does Devin "rock" her world, but so does another new student...Mark. Who is Mark, and why does he have such an impact on both Rachel and Devin? Sorry...can't tell you that. You'll need to read WHAT THE LIBRARIAN DID for yourself to find out. I hope you enjoy WHAT THE LIBRARIAN DID as much as I do, and take delight in the category romances for the short trips that they allow you take and escape from the drudgery of every day life. It's up to this librarian to find out firsthand just how "bad" he really is. Because her secret�and her growing feelings for a man who claims he's bent on redemption�depend on his turning out to be as good as he seems. Which is really, really good. Everyone said only a weirdo would turn down a date with Mary O'Connell's older brother, home from university for the holidays. And Rachel was sick of being a weirdo. Tentatively, she followed Steve's lead in the kiss and wiggled her tongue. He responded with a flattering groan. Sweet sixteen and finally been kissed. She shivered, more from the loveliness of the thought than his gentle stroking of her bare arm. Then he touched her breast and she shied away. "Don't do that." "I can't help it." Breathing heavily, Steve stared into her eyes. "You're so beautiful." "Am I?" She stripped the wistful note out of her voice. "Don't be crazy." She was passable, that was all. When she wasn't in her school uniform she wore clothes that were Mom's idea of what a young lady should wear. Rachel pulled at the button-up collar of her pink blouse. She hated pink. And plaid skirts. When she left home she'd always wear bright colors. "You are beautiful." Steve's voice vibrated with intensity. "And smart. And funny." He loomed closer again and her nervousness must have showed because he stopped with such an understanding smile that Rachel felt like a silly little girl. Sure, they were a bit isolated, sitting here in his Toyota Celica, but across Hamilton Lake, suburban lights twinkled like stars. And obviously they couldn't have a conventional date in case someone reported back to her parents. She shivered again, knowing how her father would react if he found out. But some risks were worth taking and Rachel yearned to live. They'd drunk beer, which she'd only pretended to sip, watching Steve anxiously. But he'd stopped after one can. And he'd asked her about all sorts of subjects and listened—really listened—to the answers. As if her opinions mattered. Not even Chloe, her best and only friend, did that. Normally it was Rachel's job to listen. His sincerity reminded her of Holden Caulfield, the hero in her favorite book, Catcher in the Rye, except that Steve was good-looking. Not that looks mattered; Rachel would hate to be shallow. And Steve said it was his favorite book, too. It must be a sign. Before she lost her courage, she leaned forward and initiated another kiss. This time when he touched her breast Rachel let it linger a few seconds before she removed his hand. "I should really be getting back," she said. "I've got an exam tomorrow." She took her education very seriously. It was her way out. Steve didn't get annoyed; he simply nodded and started the engine, and Rachel's last doubt dissipated. When he dropped her off at the end of the street he lifted her hand and kissed it, a French gesture that thrilled her all the way to the bone. "Say we can do this again," he begged, and she nodded because her heart was too full to speak. I'm in love. Long Beach, Los Angeles, U.S.A.
Devin shouldered his bass guitar, checked his jeans pocket and nodded, but his attention wasn't really on Zander. With a sixteen-year-old's fascination, he was watching a stripper across the bar. His brother's volatile temper had left him a bass player short an hour before a gig, and Devin was the last-minute replacement. Now he was discovering heaven had many layers. The stripper winked at him and he blushed and dropped his head. Then caught Zander exchanging grins with the drummer, and scowled. His brother nudged him. "And don't tell Mom I brought you here." It was seedy, the kind of place where people carried knives. Dimly lit, pungent with marijuana and sticky underfoot. But Devin didn't care. As they set up their secondhand equipment on the tiny platform that constituted the stage, his heart pounded harder and harder until he thought he'd pass out. This was his chance to become a permanent member of Rage instead of the awestruck kid brother sitting in the corner of the garage. When the band let him. On the rare occasions, Devin would go up to his room afterward and create riffs on his bass or Zander's discarded electric guitar, which Devin played upside down because he was left-handed. Zander had heard one, liked it and used it in one of his songs. After that, Devin had got more garage time. He knew every chord by heart—which was why he was here. So they didn't lose out on three hundred dollars. Devin wondered whether he could ask for a cut. "Don't screw this up," muttered Zander as he made his way to the microphone. Devin decided not to push his luck. Instead he wiped his damp palms on his Guns 'N' Roses T-shirt and waited for his brother's hand signal, too scared to look around in case he caught someone's eye and got knifed, or worse, kicked out for being a kid. He couldn't lose this big chance. Chris, the lead guitarist, gave his shoulder a friendly punch. "Breathe," he encouraged. Devin gulped as Zander grabbed the microphone and faced the band. His eyes and grin were wild and a charge crackled through the air and surged through Devin. He grinned back. His brother raised one arm, revealing a flash of white abdomen between T-shirt and low-slung jeans. He must be the only person in L.A. without a tan, Devin thought irrelevantly, then Zander mouthed the count—three, two, one—and swept his arm down. With Chris, Devin struck the first note of "Satan's Little Helper," and forgot his nerves, his hopes, forgot everything except coaxing emotion from his guitar. Lost himself in the music. Much later, drenched with sweat, dazed from adrenaline overload, he sat at one of the scratched wooden tables in the bar. In the round of drinks, he mistakenly got a beer and drank it because he was so thirsty. Zander noticed his empty glass. "Only one," he warned, but he was too busy lapping up female attention to stop Devin accepting another. After two beers he sat with a silly grin on his face, not feeling shy, not feeling anxious, not feeling anything but cocky. "Am I in, bro?" he called. Zander shrugged. "Until we find someone better." And Devin thought, No one will be better than me. I'll make sure of it. He sneaked a glance at the stripper again and she wasn't looking at him as though he was a stupid kid anymore, because being in a band somehow changed that. "Isn't this the second marriage proposal you've turned down?" askedTrixie. "Face it, Rach, you're a heartbreaker." "With that imagination you should be writing fiction, not shelving academia." Kneeling on the floor, Rachel Robinson snipped through the tape on the carton of books addressed to Auckland University library, then glanced at her assistant. "I'm a thirty-four-year-old librarian, not Scarlett O'Hara, and Paul is probably breathing a sigh of relief right about now." At least she hoped he was. He'd been upset last night—and she still was. Both of them had expected her to say yes. "That's another thing," said Trixie with the bluntness of youth. "Rejecting proposals is poor policy for a woman who wants a family. You may look twenty-nine but your ovaries are knocking thirty-five." Normally her protégée's homespun lectures were entertaining, coming as they did from a twenty-year-old Goth-wannabe with dyed black hair and a nose stud. Today they struck a nerve. "Maybe I'm meant to devote my life to my work." "Now that's just crazy talk." At the other end of the counter, a student approached the help desk and pressed the buzzer. "Yours," said Rachel thankfully. The first day of the university year didn't start until tomorrow, but the smart ones were getting in early. Trixie bent and gave Rachel a fierce, parting hug. "I hate it when you're unhappy. Go tell Paul you've changed your mind." So much for putting on a brave face. Hauling the books out of the carton and stacking them under the counter, Rachel wished it was as simple as that. Lately her left brain didn't know what her right brain was doing. Tentatively prodding her feelings, she found no regret or remorse, only a guilty seam of rock-solid relief. Standing, she closed her eyes, breathing in the heady smell of institutional tranquility, and tried to internalize it. Help me, she prayed silently. Why do I run every time I'm close to marriage ? Someone cleared his throat and Rachel opened her eyes. A man waited, impatiently frowning at her. He was dressed in faded jeans with slashed knees and a too-tight olive-green T-shirt stretched over muscled biceps. Ruggedly tanned, he had sun-streaked russet-brown hair curling past his collar. It wasn't that he had a five o'clock shadow at nine-thirty in the morning that screamed "bad boy." To Rachel's eyes, that simply made him scruffy. And most certainly his menace wasn't in his boots, butter-soft leather and, good Lord, purple? No, it was the arrogant way he stood—feet planted wide, arms folded across his impressive chest. It was the dragon tattoo curling the length of one muscled arm. But mostly it was the sleepy sensuality in the hooded hazel eyes casually scanning Rachel as if she were part of a female buffet. She got the impression he was already very full but might possibly squeeze in dessert—if it was handed to him on a plate. The woman in her bristled, but the librarian mustered a professional smile. "Can I help you?" The man didn't smile back. "I heard there was a library tour for those new to the college." His voice was deep, his accent American. Rachel reached for her timetable. "You're a day early, but if you give me your name I'll book you in for tomorrow." There was a brief hesitation. "Devin Freedman." "Devin. Spelled o-n or i-n?" His mouth relaxed its tight line. "I-n."
"I can give you an informal look around now if you like." For some reason his guard went up again. "I don't want any special treatment." "You must be a student," she said drily. "If you were a lecturer you wouldn't say that." Narrow-eyed, he assessed her, and Rachel nearly told him to lighten up. Then a thought struck her. "Oh, Lord, you are a new lecturer." A smile broke through the guy's suspicion. It did strange things to Rachel's stomach. Or it could be she'd been too upset about Paul to eat breakfast. "No," he said, "not a lecturer. And I would appreciate a tour. It's going to be hard enough tomorrow being the oldest student here." "Don't worry, we have quite a few adult students. I assume you're part-time?" Rachel hid her surprise. Except for the boots, he didn't look as if he could afford to pay the fees without working. On the other hand, with that body, he probably made good money working nights in a male revue. She said briskly, "What degree?" "Okay, Devin…my name's Rachel Robinson and you're in luck. I'm the subject librarian for business and finance. Follow me." She spent the next fifteen minutes walking him through the library, while he listened intently, saying little. "You're American," she commented at one point. Okay, we don't do small talk. "We have a few library tutorials of interest to you. Let me get you some brochures." She led him back to the counter and started rummaging through a filing cabinet. "I'm sure I saw him come in here." The voice was female, very young and slightly breathless. Another responded with a giggle, "Do you think he'd sign my bra?" Startled, Rachel looked up. Devin had vanished and three teenagers milled around the entry, two girls and a boy. "You promised you'd be cool about this if I brought you," the youth complained. Then he caught Rachel's eye and lowered his voice. "Shush, let's just go in and look." "Can I help you?" Rachel asked in her best librarian's voice. The boy dropped his gaze. "Uh, no, we're just looking for someone." "Famous," added one of the girls, smoothing down her skirt and scanning the rows of books. Rachel stepped into her line of sight. "So you're not here to use the facilities of the library?" "No," the girl replied, "but—"
"Then it's better if you wait outside for whoever—"
"Devin Freedman." There was worship in the boy's tone. "—you're waiting for," Rachel continued. "If you're sure he's here?" That sowed enough doubt for them to start arguing among themselves as they left. When they'd gone, she looked for Devin and found him leaning against a bookshelf in aisle three. He straightened at her approach, his expression wary. "As I was saying," she continued, "we have a few one-hour tutorials of interest to you. A library and resources overview, an introduction to our online library catalog…" She stopped because he wasn't listening, then added softly, "And I can show you the staff exit when you're ready to leave." His attention snapped back to her. "Thanks." "I'm sorry, I still have no idea who you are," she admitted. "That makes two of us." He saw her bafflement and shrugged wide shoulders. "I was a guitarist in a band that did well." And now you're going back to school? But he probably had enough of people prying into his private life. "That's why I don't know your name then. I don't keep up with contemporary pop." Something in his pained tone made her smile. "Was that like comparing Gilbert and Sullivan to Puccini?" An answering glint lit his eyes. "Sorry, I'm not an opera buff. It's always struck me as a bunch of overemoting prima donnas going mad or dying."